What am I on about? Come to SOAS on Friday to find out. It looks like a particularly interesting lecture, this time in English, but note the change of venue. “PortHamiltonMap“. 위키미디어 공용에 의해 CC BY 2.5로 라이선스됨. On 28 April 1884, Britain and Korea exchanged a ratification instrument for the Second British-Korean Treaty of Amity & Commerce (the Parkes treaty). With this treaty’s ratification, Britain and Korea created an official diplomatic channel and wrote clearly the first page of British-Korean diplomatic history. 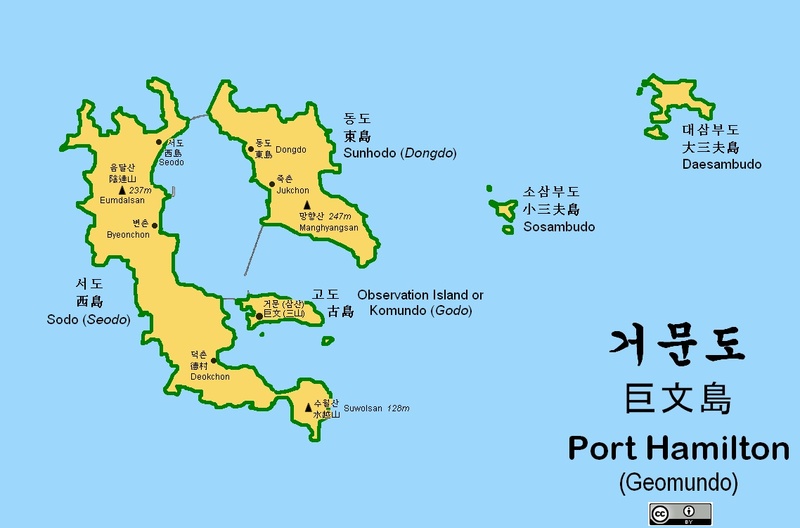 However, the Port Hamilton affair (May 1885~Feb 1887), in which the British navy occupied a Korean island group known as Kŏmundo (Port Hamilton to the British) seemed to undermine the meaning of the Parkes treaty. Several events connected with the occupation indicate that the British–Korean diplomatic link created by the treaty was ignored. Firstly, the British government directly occupied Port Hamilton without contacting the Korean Government. Secondly, the British government discussed the future of Port Hamilton with neighboring countries such as Russia and China, while excluding Korea, the sovereign power. Finally, the British withdrawal from Port Hamilton followed on from the Li-Ladygensky Joint Agreement (L-L Agreement – sometimes known as the Tianjin Agreement) of 1886, which resulted from Sino-Russian negotiations without involving Korea. The British government did not even discuss the practical arrangements for the evacuation of the islands with the Korean government. If above account is accurate, do existing studies of the Port Hamilton affair deal with the meaning of Parkes treaty in the context of the occupation? In fact, while several studies exist about the occupation, but there is little about the withdrawal. Therefore, in this paper, I will deal with British foreign policy relating to the withdrawal from Port Hamilton, and in particular, with the L-L Agreement which was at the core of it. The research focus of this paper is the evaluation of the L-L Agreement in the context of the Great Game (Anglo-Russian rivalry) and British foreign policy to East Asia. First of all, the L-L Agreement is positively evaluated in the context of the Great Game because the British succeeded in interrupting Russian progress toward East Asia without direct conflict as a result of the Agreement. And the L-L Agreement can also be evaluated positively as part of Britain’s East Asia foreign policy because it gave Britain a good reason for withdrawing from Port Hamilton without international confusion. However, this paper tries to look at the issue from a different perspective. First, the agreement failed to control Russian expansion in East Asia. By the L-L Agreement, China alone was given the task of stopping Russian expansion toward East Asia. But after the first Sino-Japanese War (1894-95), however, China’s diplomatic role in East Asia was weakened. Then no country, not even Britain, could control the Russian drive towards Asia as shown by the planning for Siberia railroad construction. To stop this kind of Russian expansion toward East Asia, Britain arranged the 1902 Alliance with Japan, the victor in the Sino-Japanese War. Consequently, it is certain that Britain could not become the victor in the Great Game in East Asia because of the L-L Agreement. The second negative evaluation of the agreement relates to British foreign policy to East Asia. Through the conclusion of the 1883 treaty, the British diplomat, Sir Harry S. Parkes prevented the Chinese Li Hongzhang (who thought that Korea was China’s Vassal State) from intervening in Korea. But the effect of Parkes’ treaty was overturned by L-L Agreement because Li started his intervention to Korea again. And, by L-L Agreement, Britain herself gave up recognition of Korean sovereignty. The major principles of British foreign policy in East Asia which were formed by Parkes were thrown into confusion, as was shown during the Sino-Japanese War (1894-95). If Britain had kept to the principles behind Parkes treaty, Britain could have arbitrated between China and Japan in order to preserve British interests in Korea, and war might have been avoided. Britain’s abandonment of the recognition of Korean sovereignty led to the outbreak of the war. Following the British position, China and Japan did not treat Korea as a sovereign nation during the war. The British government may have thought that withdrawal from Port Hamilton was a tiny incident, because the whole Port Hamilton occupation was a side issue of the Great Game. However, this paper argues that the issue of withdrawal from Port Hamilton and especially the way it was brought about through the L-L Agreement, offers important evidence for understanding of British foreign policy of the nineteenth century. My major research field is British diplomatic history in the Imperial times, focused it on its diplomatic role and influence in the world history. As a part of my research, I am studying diplomatic relations between Korea and Britain from the late 19th century to the early 20th century. Recently I have written several papers about Sir Harry S. Parkes, a famous British diplomat who served in China, Japan and Korea to the 19th century. THE SEMINAR WILL TAKE PLACE IN ROOM FG08 OF THE FABER BUILDING (PLEASE NOTE CHANGE FROM USUAL SEMINAR ROOM). The Faber building is located adjacent to the main SOAS building on the corner of Russell Square (you can ask for directions at the reception of the main building).